Gamakatsu is known for it’s innovative but functional designs, the “Wacky Head” jig is no exception. With its unique flat shape, the “Wacky Head” will entice the finickiest of biters with its side to side rolling type action. 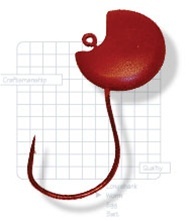 Also to add to its attraction is the red epoxy head, and a short shank wide gap designed hook for a greater bite surface area for those short biting fish.